St. Augustine, Bishop of Hippo (c. 354-430) whose feast we celebrate on August 28, is recognized as one of the greatest Doctors of the Western Church. The unceasing prayers of his mother, St. Monica and the powerful preaching of St. Ambrose are credited with Augustine’s conversion from the dissolute lifestyle of his youth. 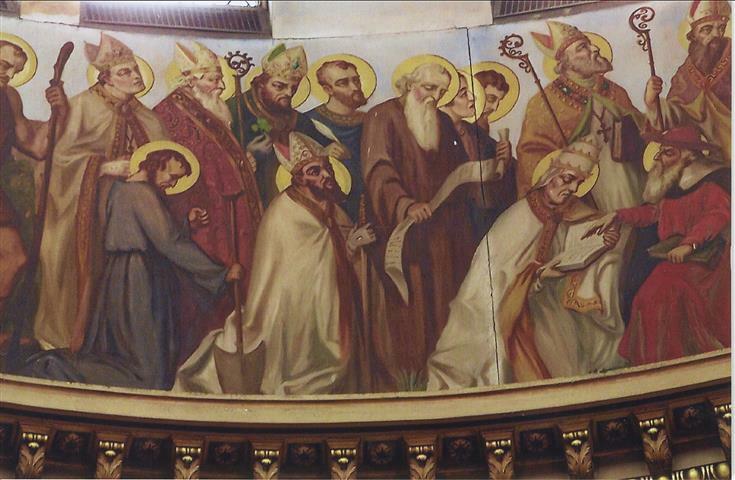 His image appears in Joseph Mazur’s painting of “Confessors, Bishops, and Missionaries” in the dome of our church. Augustine is depicted at the far right in this photo, standing, wearing a bishop’s mitre and holding a crosier. St. Ambrose (c. 339-397), Bishop of Milan, appears (standing) to his immediate left. Photo credit: Duane Held. *In response to requests from our players, we have instituted age restrictions for admission to Bingo. As of October 15, 2015, we no longer admit children under 8 years of age. To check the Red, White & Blue and progressive Share-the-Wealth carry over amounts and progressive numbers for this week, click HERE and visit our Facebook page. Our Summer Mass Schedule is now in effect. Please note that there is NO Mass on Mondays, and the Tuesday Mass time has changed to 11am. Masses on Wednesday through Friday will continue at 11am. Friday, September 1 ~ First Friday ~ Adoration and Exposition of the Blessed Sacrament from 8:00 – 11:00 a.m.
Stewardship is is recognizing that everything we have is a gift from God. We can take for credit nothing. Everything we have and everything we do is the result of some gift that God has placed into our hands. Father Victor welcomes friends and parishioners at social celebrating his seventh anniversary of ordination. Ordination Anniversary Celebration ~ There will be a reception in St. Charles Hall following the 10:00am Mass on Sunday, August 27, to celebrate Father Victor Ibhawa’s seventh anniversary of ordination, which is August 28. Please join us. First Friday Adoration is this week on September 1. Sign-up sheets are posted by the side doors for those who wish to join in prayer anytime during Exposition of the Blessed Sacrament (8-11am). Benediction and Mass will follow. This weekend we welcome Marpha Delaney, a spokesperson from Christ the King Seminary, who will speak with us about the importance of the Seminary in educating priests, deacons, and lay ministers, and the special collection for the Seminary on the weekend of September 2/3. Please give generously. Parish Council Elections ~ We are pleased to announce that the following parishioners have agreed to run for election to the Parish Council: Nik Brodfuehrer, Lorna Cameron, Tom Dinder, Dorothy Manuppelli, Kathleen Marien, Joseph Nwoglo, Michael Ogoh, Kathy Press, Bonnie Williams, and Don Williams. Elections are scheduled to take place at Masses on the weekend of September 9/10. The Council’s nominating committee is grateful to each and every one of them. To assist parishioners in selecting their four candidates, we have placed posters with photos of the candidates inside the church’s three entrances. Do you have a song in your heart? The Blessed Trinity Choir is looking for a few good men and women to enhance our liturgy through the gift of music. The only requirement is a love of The Lord – no audition necessary. We meet on Tuesday evenings beginning September 5 from 7 to 8:30pm in St. Charles Hall. If you have an interest in serving your Church through our music ministry, please join us. Contact Elizabeth at 716-472-0009 with any questions. We look forward to hearing from you! Bible Study resumes Monday, September 18, at 7pm. Contact Althea Porter at 716-316-8395 for information. We are in need of additional lectors and Eucharistic ministers. We will be including young readers in this helping ministry. Those who are interested, please contact the office at 716-833-0301. Helping Hands Food Pantry ~ The Helping Hands Food Pantry not operates on Saturdays only from 10am to 2pm. Its director, Luis Clay, is also seeking additional volunteers. Please contact the church office at 716-833-0301 if you or someone you know might be interested in this opportunity. Wedding Anniversary Mass ~ Any couple celebrating a 50th, 60th or 70th Wedding Anniversary during 2017 is invited to participate in a special Mass to be celebrated on Sunday, October 15, 2017 by Bishop Richard J. Malone, at 3pm at St. Joseph Cathedral located in downtown Buffalo. Following the Mass, an informal reception will be held at the Adam’s Mark Hotel. Family members are also encouraged to attend. A special certificate will be signed by Bishop Malone to honor the occasion, even for those who are unable to come out to attend the ceremony. For further information, please contact Catherine Kwiatkowski at 716-847-2210 or email ckwiatkowski [at] buffalodiocese [dot] org. Seating is limited. You may also place your name on the list by calling the our parish secretary, Pat Pendleton, at the church office as soon as possible. Party for Sister Maureen Harris ~ Save the date … September 17 (12:30-2:30pm) at Ss. Columba-Brigid’s parish hall. Everyone from the CCCB parishes is invited to attend a Bon Voyage Tea Party for Sr. Maureen Harris on that day. If you haven’t already heard, Sr. Maureen has volunteered to travel to our Sister Communities in Tanzania, Africa. She leaves for six months at the end of September—first to Rome—and then on to the mission territory, where she will travel and walk with our Sisters and the people in their missions. Sr. Maureen spent three months there in 2008 teaching English as a second language. This time she will follow up with the Sisters, assist with their record keeping, and offer an encouraging presence as the Sisters cultivate leadership within their own communities. We would like Sister Maureen to have many happy memories to sustain her during her six months abroad, and you can be one of them by attending on September 17. Honoring Father Roy Herberger ~ A very special part of the central city vicariate, Rev. Roy Herberger, is retiring at the end of this month after 49-years of active ministry. His final Masses and celebration with his parishioners at Ss. Columba-Brigid are Saturday and Sunday, August 26 and 27, 2017. Anyone who wishes to send Fr. Roy Herberger a note, please address them to him at 75 Hickory Street, Buffalo, NY 14204. Openings for Mass Intentions ~ Thank you to all who have recently placed Mass intentions. Please contact the church office (716-833-0301) with your requests. Office hours are: 10:30am-2:30pm, Tuesday through Thursday. The Mass Stipend is $15. Important Deadlines to Remember ~ Our bulletin is printed on Thursdays, so please remember to submit your announcements to our secretary, Pat Pendleton, no later than Noon on the Wednesday prior to the weekend you wish it to appear. Announcements to be read at weekend Masses are due on Thursday. You may contact Pat at blessedtrinitychurch@gmail or 716-833-0301 any Tuesday, Wednesday or Thursday between 10:30am and 2:30pm. Parish Record Keeping ~ If you need to update your contact information or would like to register as a parishioner, please call the church office (716-833-0301) on Tuesday, Wednesday or Thursday during office hours: 10:30am-2:30pm, email your contact information to blessedtrinitychurch [at] gmail [dot] com, or use the CONTACT feature of this web site. Marriage Preparation Classes will take place at D’Youville College (329 Porter Avenue) September 9, October 7, November 5, and December 2. Register through the Office of Family Life Ministries at 847-2210. Find out more at buffalodiocese.org/for-the-engaged. 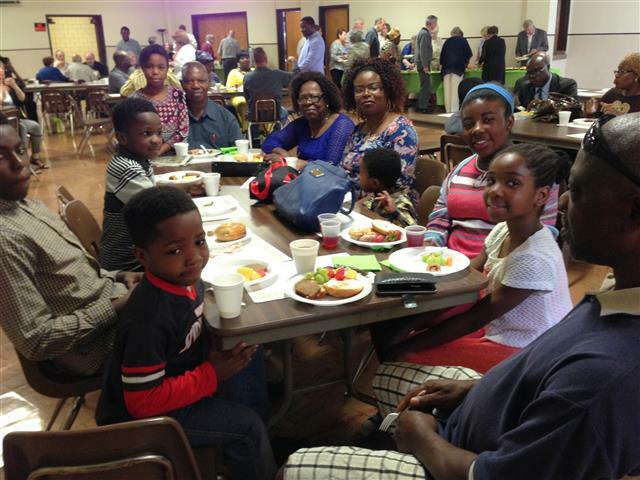 Biannual Congrega Society of Buffalo Mass and Breakfast at Saint Lawrence Parish is Saturday, September 9. Find out more at stlawrencebuffalo.org or call 716-656-7195. Annual Convocation and Mass of the Holy Spirit at SUNY Buffalo State College is Sunday, September 10 at 10am in the Social Hall at the Mildred Campbell Student Union. Join the faith community of the Newman Center in celebration of the Eightieth Anniversary of its founding and invoke God’s blessing on the new academic year. 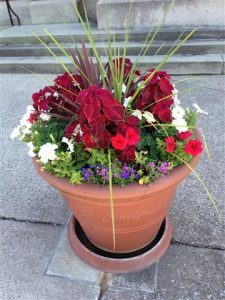 Walking with Grief monthly lecture series and support group at St. Christopher Parish is the second Wednesday of every month from 6:30-8:30pm at St. Edmund Campus (Fr. Smiroldo Center – 530 Ellicott Creek Road, Tonawanda). These evenings are provided to assist any person 18 years of age or older in their journey of grief. Each month a guest speaker offers knowledge and insight into the grief journey. Time for Q&A is provided. After the 20-30 minute presentation, attendees have the option to participate in small groups according to their loss. There is no charge for attendance and all are welcome. Call St. Christopher Parish Office at 716-692-2660 with any questions. The Role of Faith Communities in Ending the HIV/AIDS Epidemic ~ A Faith Forum, Tuesday September 19 (9:30am – 3:30pm) at Colgate Rochester Crozer Divinity School in Rochester. All are welcome. Pre-register by 9/12/17. Call 800-692-8528 or email elizabeth [dot] greenwood [at] health [dot] ny [dot] gov. “Welcoming the Stranger” Prayer Services will take place in September. Hosted by the WNY Leadership Conference of Religious Women, come learn about refugee advocacy opportunities. Prayer services will be held on September 15 at 7pm (St. Mary Center, 241 Lafayette Ave., Buffalo); September 17 at 2pm (St. Mary of the Angels, 201 Reist St., Williamsville and at St. Elizabeth Motherhouse, 115 E. Main St., Allegany); September 24 at 2pm (Immaculate Conception Convent, 5229 South Park Ave., Hamburg and at the Sacred Heart Center, 22 Meadowbrook Pkwy., Cheektowaga); and September 24 at 4:30pm (Immaculate Heart of Mary Convent, 600 Doat St., Buffalo). Personal hygiene items may be donated at any of these services to refugees in Jericho Road’s Vive program. Religious Emblem Program for Girl Scouts and Boy Scouts wishing to earn Catholic Religious Emblem badge. Adults interested in working with older scouts in the Religious Emblem Program, please join a training session on September 23. Contact Sue Vermeulen at 716-778-8887 or sue1221 [at] aol [dot] com. “The Beginning Experience” ~ Turn the pain of loss into an experience of positive growth during a weekend program for those who have worked through the initial stage of grief after a death or divorce of one’s spouse. The Beginning Experience weekend at Camp Stella Maris on Conesus Lake will take place in October (date to be determined). For information or registration, call the Diocese of Rochester at 585-987-1750.